Martha Borst - Author of Your Survival Strategies are Killing You! Do you ever feel like you're swimming upstream against the current, working hard, making little progress, nearing exhaustion, and sinking fast? How do you move from this survival mode and begin to thrive? Through this intriguing corporate tale, you will be captivated by the experiences of four characters who, in a few life-changing days with Martha—the enigmatic coach and guide—learn how they are blocking their own success and happiness. Like them, you will uncover what is keeping you from designing your own powerful future —and you will discover how to apply the eight principles to turn your life around and thrive! "Compelling and highly engaging reading, this remarkable book is for everyone who is willing to rethink their most basic assumptions about what works in business and life. This is a "must read" for all leaders and individuals who want to thrive with abundant, enduring success in our rapidly changing world." "Your Survival Strategies are Killing You! will be required reading for anyone I work with. In these pages, Martha captures and demystifies the beliefs that you think will drive your success and ultimate happiness, but she shows you that in order to grow into your potential, you have to first change yourself; your self-perception and your self-seeking behaviors. Can a single book fix all of your company’s problems? Probably not. But can you fix all of your company’s problems without the principles in this book? Definitely not!" "Your Survival Strategies are Killing You! masterfully connects readers with their own potential by skillfully including them as participants in a compelling human tale. Author, trainer, and coach Martha Borst captivates from the outset by inviting her readers along for the ride as her four protagonists experience their own journey of self-mastery. It isn't long before you realize she is talking directly to you! As the drama unfolds, the power of these principles to clear up many of one's problems and the wisdom to create an exceptionally successful life become impossible to ignore. I can't think of one person who wouldn't benefit from reading this book." "Your Survival Strategies Are Killing You! is the single best approach to effective team building and personal empowerment that I have ever observed. As an HR professional, I enthusiastically endorse this book as a valued resource tool. Martha Borst masterfully makes the learning process easy by using an entertaining and engrossing story to reveal a set of guidelines that can transform not only your corporate culture, but your life as well." "I loved this book! I defy anyone who has worked in the corporate world to not identify with one or all of the players. In fact, it is impossible to read this without reflecting on "What does this mean to me?" This is not the typical business book that gives you lists of things to do, theorems, seven rules, etc. The concrete and practical principles presented are natural and memorable and penetrate your mind and emotions. They hold true in life as well as work. There is exceptional value here for everyone." "Having sponsored a team who participated in one of Martha's courses, similar to the one depicted in this book, I was able to actually see the personal growth experienced by my colleagues, as well as myself, over our three days with her as our coach. The valuable insights she shares in Your Survival Strategies are Killing You! opened our eyes and helped each of us to take a fresh look at our attitudes and behaviors. Everyone would benefit from reading this book closely and then refreshing themselves with it every six months!" "Martha Borst's practical and profound voice is calling in a wilderness of high achievers stymied in their search for fulfillment and effectiveness. She's calling on us to pay attention to our own lives in a way few people do. Your Survival Strategies Are Killing You! is a simple, straightforward story that opens the door of self awareness behind which personal freedom and professional success are found. A rare "must" read; accessible across the organizational chart, this remarkable book invites everyone to take ownership of their individual and collective destinies!" "Your Survival Strategies are Killing You! is a fast and fascinating read full of great lessons. The story will teach you what you need to know today to help you and your team be more successful. Martha brings clarity to issues that we struggle with in business, but should not. Her approach has changed the way I deal with people everyday. This is a book you will want to share with everyone you know. I guarantee you, one copy won’t be enough!" "I have had the privilege of actually attending a Martha Borst course similar to the one described in this book. I can unequivocally say that every leader who wants an empowered, accountable, aligned, excited, productive team should read this immediately – and then give copies to everyone. Like her course, the experience delivered in the reading of this book is both enlightening and entertaining – and ultimately a springboard for effecting powerful organizational change." "Martha Borst knows how to achieve SUCCESS! As her personal physician for several years, I observed her doing so in spite of her formidable health problems which she faced with a positive attitude, grace and courage. 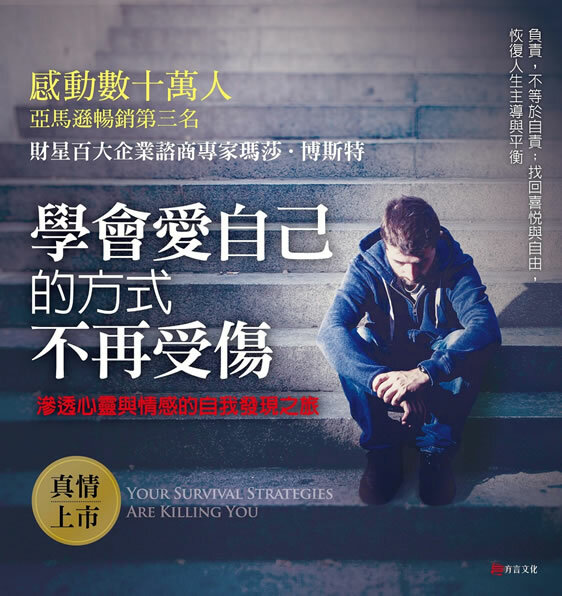 Reading and studying Your Survival Strategies Are Killing You! will help you develop new and important strategies for overcoming your own obstacles while achieving your goals. I wish that I had read it twenty years ago!" "The message of Your Survival Strategies are Killing You! works universally. I put the teachings at the heart of three different companies, across four cities and two continents. It’s been the difference between success and mediocrity of my teams, and it’s brought personal fulfillment and joy to my own daily life. Living the book is a must for any entrepreneur eager to compete in the fast-changing global economy." "Your Survival Strategies Are Killing You! is a great read. Its fictional style hammers home perspectives and lessons that we need. It teaches people to collaborate more effectively and uses wisdom to become more productive, impactful, and happy. What a book! Not only is it entertaining but it provides valuable tools that create the kind of behavior and thinking that we need in our fast changing global innovation economy." "Outstanding! This exceptional book provides eight simple yet profound tools for elevating your performance at work and your experience of life. If you read only one book this year, make it this one. What you discover about yourself within these pages, will change your future forever." "NEW!!" 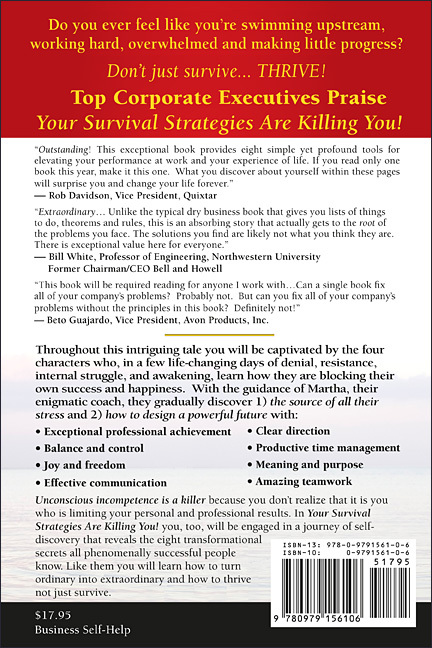 Martha's book, Your Survival Strategies Are Killing You! has been selected by the Chinese InVision training company and the Chinese government to be a guide book for their personal and professional coaching programs.